We got up earlier than usual today. At 7.45 o’clock in the morning we gathered at the entrance of Cripps Court and waited for the coach that would bring us to the capital of the UK, London. Since the coach had some delay I could even have some coffee to get myself started. After a journey of about an hour the bus dropped us at the Tower of London. 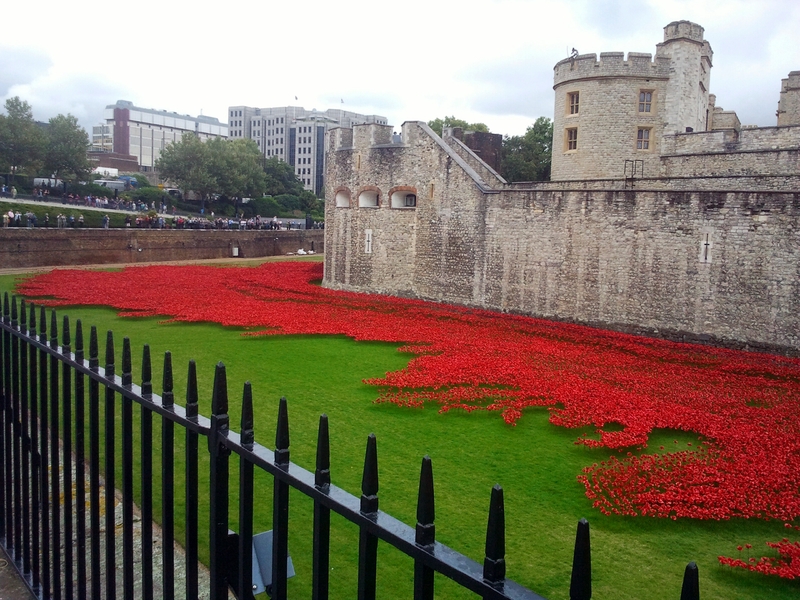 There, we had the chance to take a look at this incredible piece of art at the walls of the tower, where 888,246 poppies out of ceramics are going be stuck in the grass. Each of these flowers represents a British military fatality during the First World War. I found it highly impressive how much work it must had been to produce the already existing poppies and to stick them into the ground. Additionally, the red colour of the donated flowers – 25 pounds each – reminded me of blood running down one of the major symbols of war in this country. What a message! After our short visit at the Tower we started with our guided tour trough the financial centre of London, the so-called City. Although it was quite loud, since there was a lot of traffic and construction work going on, I was amazed by this mixture of ancient and modern architecture. It was also interesting to experience the working life in the district, from where so much wealth is managed and generated. Of course, this was only possible at a limited scope, but we got a slight impression what working in the City could actually mean. 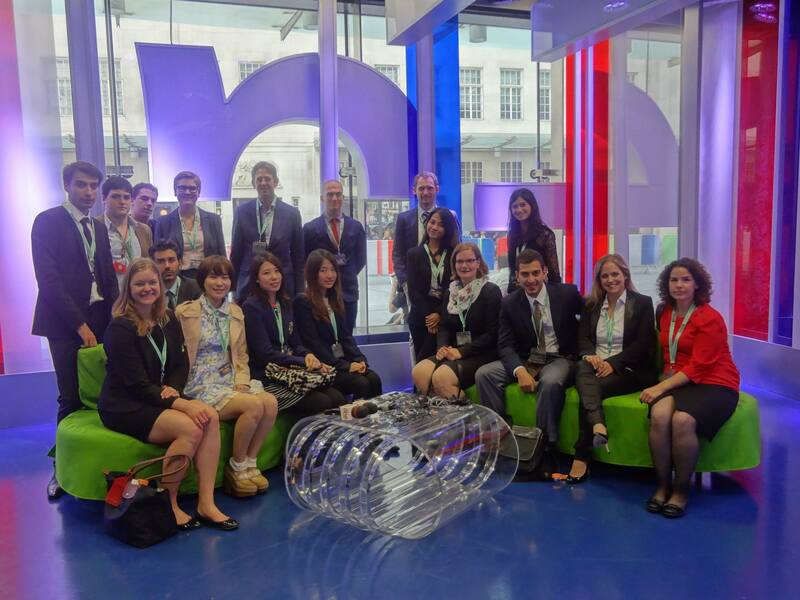 After the tour we got onto the coach again and drove to British Broadcasting Corporation, commonly known as the BBC. As a fan of two particular BBC series – one dating back to the 1960s and the other quite recent – I was excited that we had the chance to see the place, where those series are, at least partially, produced. During our tour we got a view behind the scenes of a worldwide news service. In the beginning we could watch the weather woman waiting for her appearance and ultimately presenting the forecasts for the next days. Afterwards we got a brief introduction on how the BBC acquires and distributes news. We were also given the opportunity to make our own news report. It was great fun to see some delegates sitting in the chairs of professional reporters and presenting news. But since the BBC is not only a TV station, we got a tour through the radio station as well. There, some of us did a short radio drama, where I spoke the part of a mad butler. That was quite exciting, especially since well known actors have performed in the same room for decades before me. After the tour ended we got some coffee, got onto the bus and drove back to Cambridge. And it would not have been a trip to London if there had not been a congestion. But after three hours we finally arrived at Cripps Court, where we participated at the evening talk on the legal protection of foreign investment to finish off the day. Well, actually we finished the day at a nearby pub, where we ate some burgers and had some good drinks.